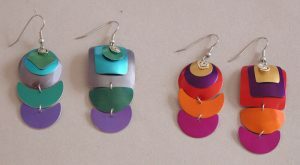 Earrings come on surgical steel wires, titanium posts, or clips if requested. In pictures where one earring is shown, a pair is symmetrical, when two earrings are shown the pair is asymmetrical. If you prefer symmetrical earrings, choose the side you wish a pair of. 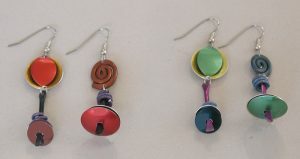 All earrings available on post, clip or wire. 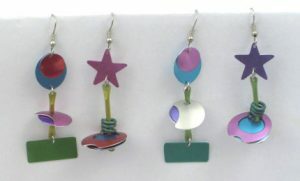 Asymmetric pair of earrings, 2” long with 5 colors. Shown in Hot (left) and Krakatoa. 2 2/2″ long in Caribbean (left) & New Pastel. 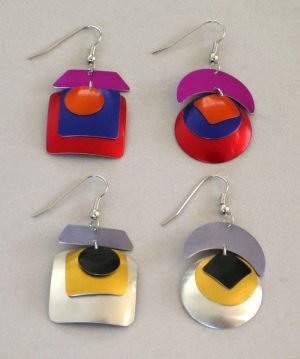 Asymmetric pair of earrings in 4 colors 2″ long pictured in Vesuvio (left) & Provence. 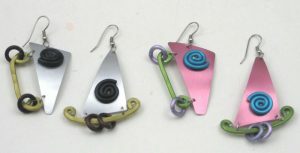 Asymmetric pair of earrings, 2 ¼” long with 5 colors. Shown in Primary (top) and Marrakech. 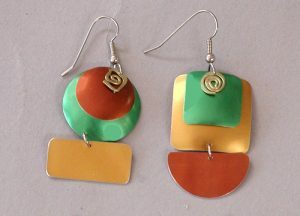 Asymmetric pair of earrings 1 ¾” long, three colors with silver and gold details. Shown in Basic (left) and Cool. 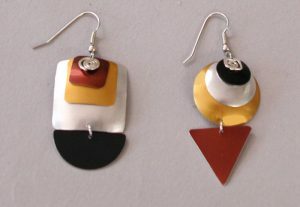 Asymmetric pair of earrings, 2 ½” long with 4 colors. Shown in Manhattan (left) and Hot. 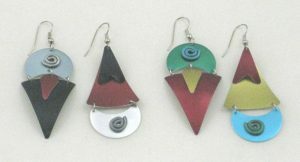 Asymmetric earrings 1 ½” long. Shown in Hot (top) and Basic. 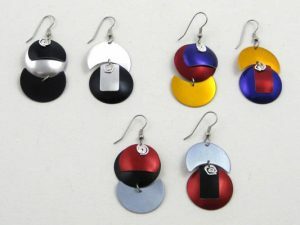 Asymmetric earrings 1 ½” long, 3 colors with silver details. Shown in Sienna. 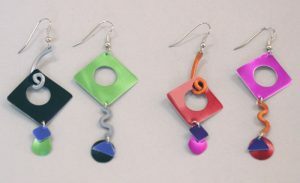 Asymmetric pair of earrings 1 ½” long, four colors. 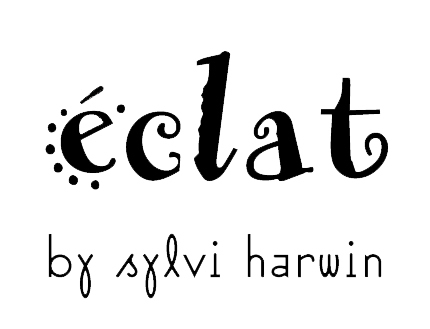 Shown in Basic. 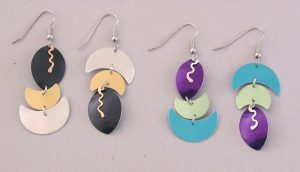 1 ¾” asymmetric pair of earrings in 5 colors, with silver or gold detail. Shown in Ocean (left) and Hot.